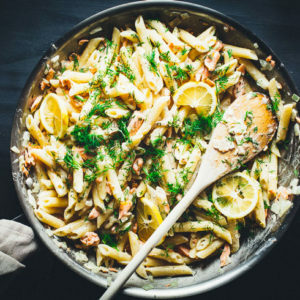 This super easy to prepare pasta dish is a classic combination of bright and citrusy flavors of lemon, vodka, salmon and fresh dill; making Creamy Lemon Vodka Salmon Pasta. 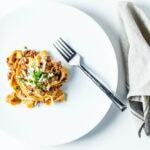 I used penne pasta, but you can definitely substitute any type of pasta that you wish, and it will turn out great. I always forget how wonderful Salmon is until I sneak a tender flake off the side right when it finishes cooking. Along with being extremely good for you, it’s such a beautiful and luxurious ingredient that I could probably eat almost every day in some form. I always recommend using wild salmon from the Pacific Ocean. Alaskan Salmon is often seen as the best, but it depends on the season as to what is available. I talk more about the differences between wild and farm-raised salmon in this pan-seared salmon recipe post. 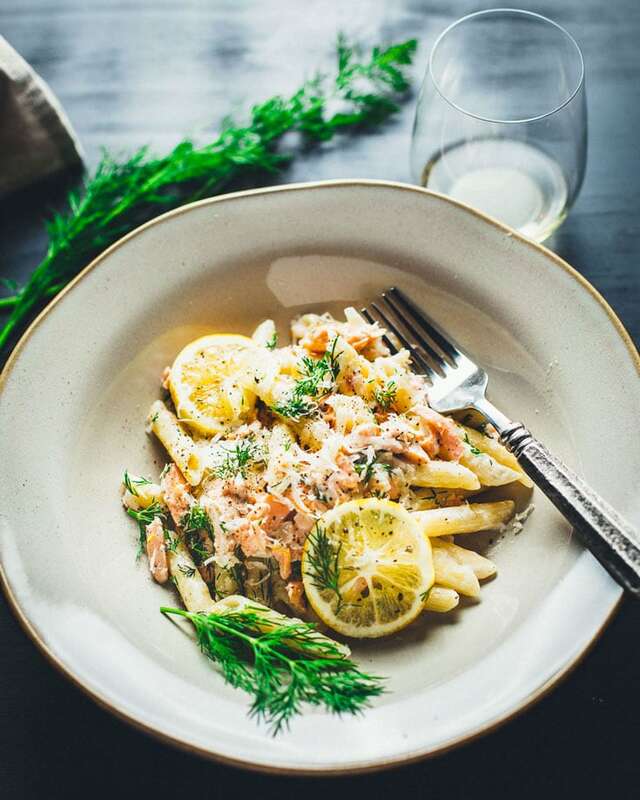 Cooking salmon for pasta can be grilled, sautéed, baked, or you can even use pre-made smoked salmon and just add it into the pasta sauce. You can either leave it in large filets or cut it down into smaller pieces for quicker cooking. 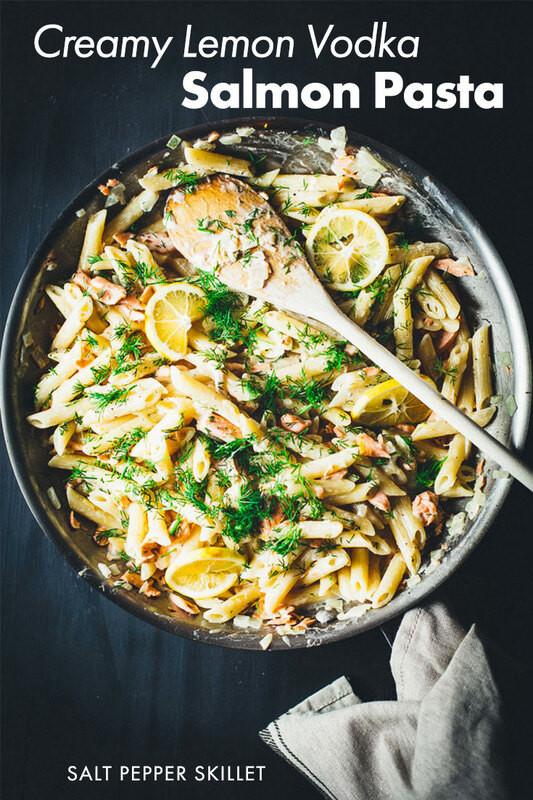 Leftover salmon from another meal is great to use in this pasta. 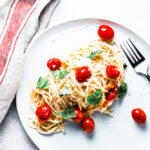 Bring 4 quarts of salted water to a boil and cook the pasta al dente, as it will finish cooking in and absorb the sauce. Reserve 1/2 cup of the pasta water. Heat the butter in a large skillet on medium heat. Sweat the onion with some salt until it is tender and translucent, but not browned. Pour in the vodka and reduce it down until it is almost gone. Add the cream and cook until it just starts to bubble. Gently stir in the cooked salmon and warm through. Add the cooked pasta and continue cooking until the sauce begins to thicken, about 2 to 3 minutes. If the sauce is too thick, add a little of the pasta water. 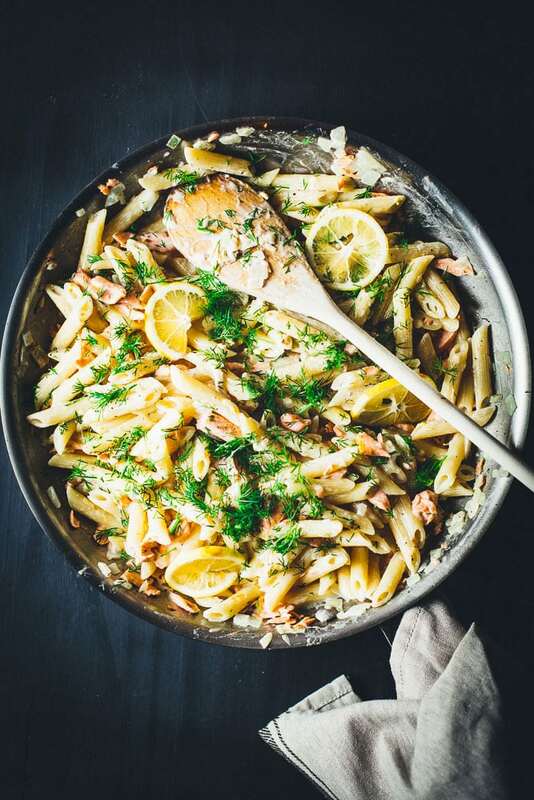 Remove the skillet from the heat and stir in the juice from the lemon, the zest, parmesan and fresh dill. Taste and season with salt and freshly ground pepper. 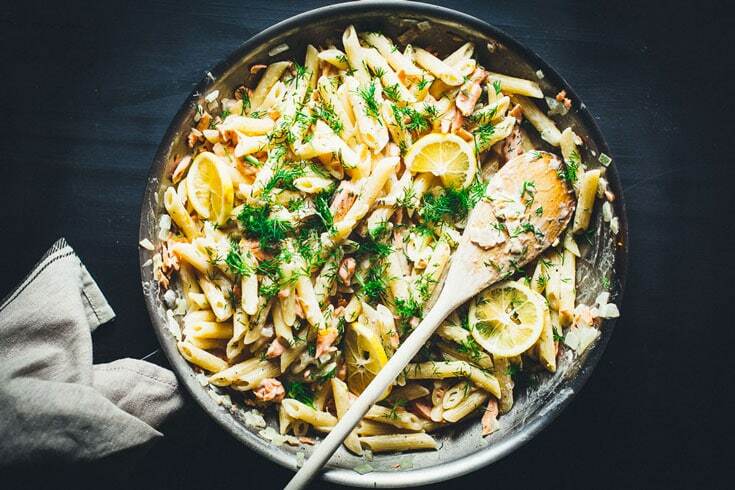 Garnish with thin lemon slices, fresh dill and more parmesan. 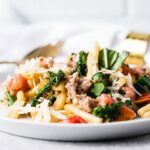 Sausage, broccolini, red peppers and tomatoes combine to make this simple yet completely delicious pasta. 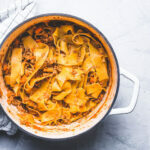 Seafood bolognese made with ground Opah (Aka Moonfish or Manbou) might not be your traditional bolognese sauce, but it sure tastes like it.